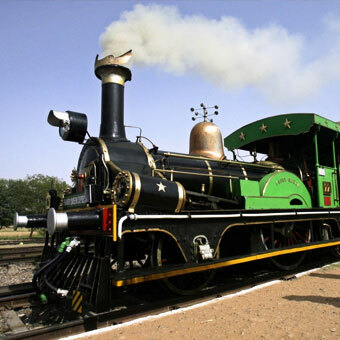 The oldest working steam locomotives in the world, the Fairy Queen made its maiden journey in the year 1855 for the erstwhile East Indian Railway. And rightly so, the Fairy Queen today holds the Guinness World Record for being the oldest locomotive in regular operation. It used to travel on the Howrah-Raniganj line and later in Bihar till 1908. 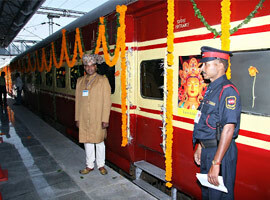 In July 1997, the Indian Railway restarted its operation as a heritage train from Delhi to Alwar and back. It operates on the 2nd and the 4th Saturday of the months of October to March. 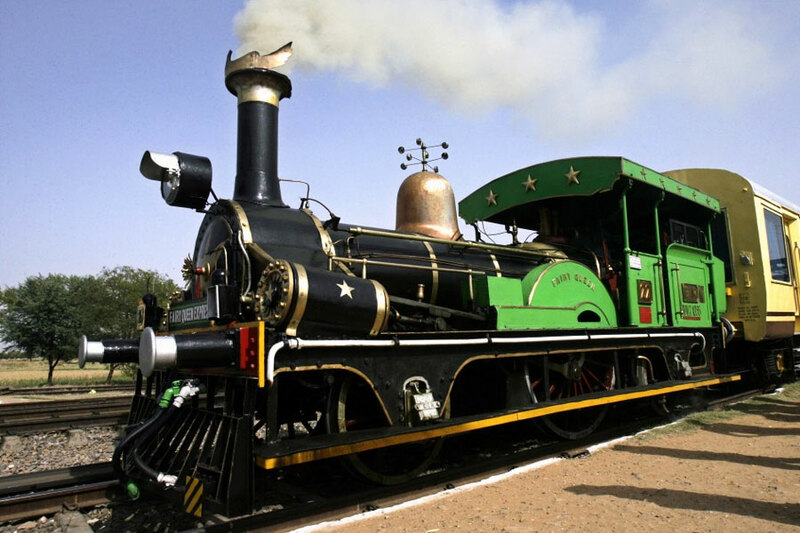 The Steam Express is a Heritage train journey package of 01 Day which is hauled by Vintage Steam locomotive WP 7161 "Akbar" which is easily recognized by the cone shaped bulging nose with a silver star painted on it. This train has a 60 seater, air –conditioned chair car specially designed with a large glass window so that you can have a view of the countryside. There is a pantry car for on-board catering and service of food to the guests travelling on the train. As an added attraction, the coach has a beautiful lounge from where you can have a scenic view of the countryside. 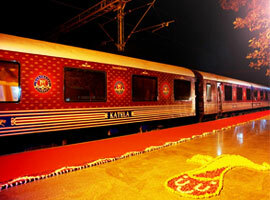 The train operates on the Delhi-Rewari–Delhi route. 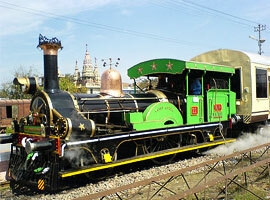 Fairy Queen is the wolrd's oldest rolling locomotive. The train started its maiden journey in the year 1855 and had been operational till 1908 when due to some reasons its regular operations were halted. In July1997, the Indian Railway restarted its operation as a heritage train from Delhi to Alwar and from there the tourists are taken to world famous Sariksa Wildlife Sanctuary. The Fairy Queen has only two coaches attached to it. One, a specially designed air-conditioned car with fifty comfortable seats on which guests can recline and enjoy the ride from Delhi to Alwar and back. Besides there is a well maintained pantry car for on board catering. The additional attraction on the train is the lounge in the front of the passenger coach. Its large window offers a beautiful view of the Fairy Queen engine as it puffs away and steams across the countryside of Rajasthan on its way to Alwar. 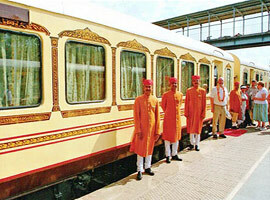 The journey on the Fairy Queen luxury train is a day journey and there is no overnight stay on the train. Passengers stay overnight at the Sariska Palace Hotel. 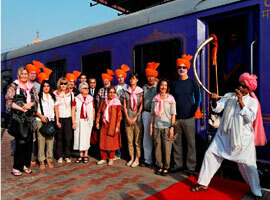 For your enjoyment numerous cultural programs are organized on the evening of the first day at the Hotel Sariska Palace. Destinations : Delhi > Rewari > Delhi. 09:30 hrs : Reporting at the Delhi Cantonment Railway Station. 10:30 hrs : Steam Express departs. 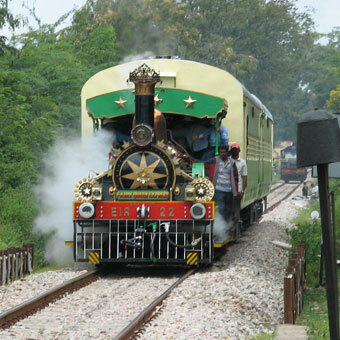 Train will be hauled by Steam locomotive from Delhi Cantonment to Rewari. 16:15 hrs : Departure of Train from Rewari Station.Train may be hauled by Diesel locomotive from Rewari to Delhi Cantonment. 18:15 hrs : Arrival of Train at Delhi Cantonment Railway station. The Steam Express Package Tariff in Rs. *(Half fare for children above 5 years but below 12 years of age). *Children below 5 years – Free. Foreigners can pay equalent amount in USD. To and fro journey and a visit to the Heritage Steam Shed at Rewari. The train composition shall be with WP 7200/WP 7161(Steam Locomotive) + SLR 18075 + NR WFCRR 94479 + NR WCBRRM 94194 OR Train composition shall be with Fairy Queen EIR 22(Steam Locomotive) + NR WFCRR 94479 + NR WCBRRM 94194. 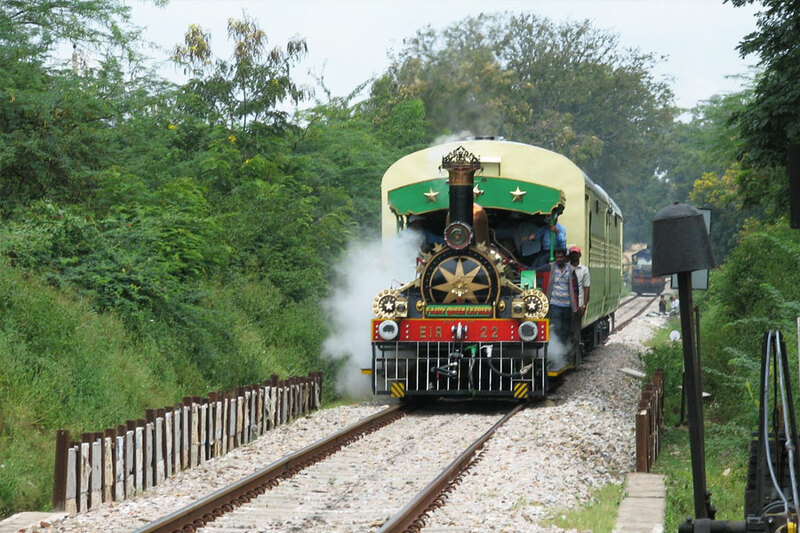 The Train will be hauled by Steam Locomotive between Dellhi Cantt. and Rewari and return trip from Rewari to Delhi may be operated by Diesel traction. (Tourists to please note the mode of traction at the time of booking). Foreign Tourists will be charged as per the prevalent exchange rate of INR vis-a vis $. Note: "In case of failure of Steam Loco enroute,the journey shall be completed using Diesel Loco". 1. There shall be no refund except. a)- When the train is cancelled for technical reasons by the Railways. b)- When the tourist is not able to travel on account of unforeseen circumstances. (I) No refund, if the ticket is cancelled less than 15 days in advance including the date of journey. (II) 50% refund, if the ticket is cancelled more than 15 days in advance excluding date of journey. The Capital city of India, Delhi is one of the well known historical cities of the world. Delhi represents a mix culture of old-world charm and a pulsating mega polis. Due to its strategic location, it has been the capital of India since the beginning of the 8th century A.D. Delhi is famous for its cultural diversity, architectures, monuments, forts, museum, galleries, temples and beautiful gardens. Qutub Minar : A 72.5 m high victory tower is a fine blend Muslim and Hindu Architecture. In its courtyard is located the Ashoka Pillar inscribed with a Sanskrit text. Red Fort : Mughal Emperor Shah Jahan built this famous monument. The fort houses some of the magnificent architectures. The Diwan-e-Khas, Diwan-i-Aam and Moti Masjid inside the fort are worth visiting. Jama Masjid : Located infront of the Red Fort, the Jama Masjid is one of the masterpiece of the Mughal architectures. The Chandni Chowk, in its close vicinity is a famous shopping center in Delhi. Jantar Mantar : Jantar Mantar is an astronomical observatory, was built by the king of Jaipur, Sawai Jai Singh. Bahai Temple : Made in white marble, this temple is shaped like a lotus flower. A huge hall inside offers a place for quiet thought and meditation. Humayun's Tomb : Located inside a beautiful garden the Char Bagh, this magnificent tomb in red sandstone is one of the finest architecture of the Mughal period, a must see for the tourist visiting Delhi. Besides, there are many architectures of the British period. Most famous among them are India Gate, Rashtrapati Bhawan, The Parliament House, Rajghat, Connaught Place, The Mughal Garden and The National Museum among many others. Alwar is located at about 170km from Delhi and 150km from Jaipur, in the beautiful surroundings of the Aravallis. The city is referred to as the gateway to the historically and culturally rich state of Rajasthan. Alwar's popularity as a tourist destination lies in its proximity to the famous Tiger Reserve of India, Sariska Wildlife Sanctuary. Other tourist attractions in Alwar are the Bala Quila, a massive ancient fort situated on a hill, and the Vinay Vilas Mahal, the city palace complex. Other than historical monuments, the city has a rich natural heritage with some beautiful lakes and picturesque valley thickly wooded in parts. A beautiful lake beside the city palace is a good spot to visit. The tomb of Tarang Sultan is also a tourist attraction worth visiting in Alwar. There are various tourist spots around Alwar. 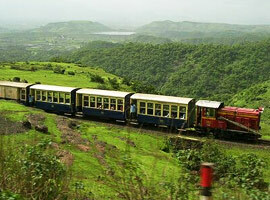 In Silisher town there is a picturesque lake, while in Kesroli you can visit a beautiful hill fort. Yet another exotic and picturesque Jai Samand Lake lies just 6 km north of Alwar. Sariska is located about 34 km from Alwar in the state of Rajasthan. The place is world famous for its wildlife sanctuary that houses one of the best tiger reserves of India. Statistically there are about 30-40 tigers at Sariska. The sanctuary is picturesquely surrounded by the hills and narrow valleys, which supports the growth of scrub-thorn arid forests, dry deciduous forests, and grasses providing the necessary food for large number of wildlife here. Besides the magnificent and mighty tiger, there are leopards, sambars, jungle cat, jackal, hyena, fox, chinkara, wild boar, nilgai, civet, four-horned antelope, gaur and porcupine among many others. You can also spot a variety of exotic and rare birds including peafowl, gray partridges, quails, sand grouses, white-breasted kingfishers, golden-backed woodpeckers, crested serpent eagles, vultures and horned owls. Apart from wildlife you can also visit the ruins of some of the temples of the 9th and the 10th centuries here, famous among them is the temple of the Hindu God Shiva. A magnificent castle located on a hilltop at Kanakwari provides an excellent view of Sariska's inhabitants specially birds .The Sariska palace, built by the erstwhile Maharajas of Alwar and now a heritage hotel, is located very near to the tiger reserve and here you can hear the sounds of roaring tigers. The famous Fairy Queen leaves Delhi Cantonment Railway station on every 2nd and 4th Saturday of the months between October to March. During rest of the year it is halted for engine and coaches renovation and also because of hot summer. The train starts its journey on every 2nd and 4th Saturday, in the months of October to March from Delhi Cantonment Railway station.